This precision saw is made to cut glass, tile, ceramics and stone quickly and easily. The sliding table gives great precision to long, straight cuts in materials up to three inches thick. 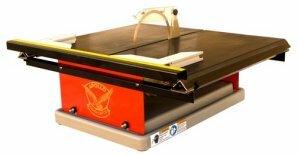 A perfect saw for fusers as it will allow you cut straight and true in heavy fused or cast glass pieces. It can also be used for creative work such as cutting wine bottles - even lengthwise. There is a wide variety of blades available for every purpose. Instead of locking you into a "standard" blade, we give you the option of choosing the best blade for your needs. Speeds blade changes. Most changes can be made in about a minute or two. Unlike standard plated blades, sintered blades expose more diamonds as they wear. Blades stay sharp right to the very end. Unlike electroplated diamond blades found on ring saws, these sintered blades have the diamonds completely imbedded in the metal of the saw blade. As the blade wears down, new diamonds are exposed. The blade cuts as good as new, right to the end. 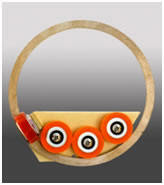 6" Diameter will cut materials up to 3" thick. 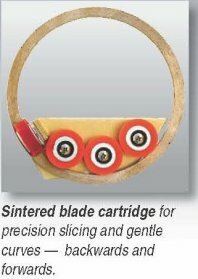 This blade will cut gentle curves, forward and backwards, as well as accurate straight lines. materials up to 3" thick. Use this blade for straight cuts only. The extra strength of this rigid blade allows you to apply more pressure for quicker cutting. The blade on this cartridge has the long life of sintered blades. The diamonds are exposed on the front side of the blade only (the brassy ring on the photo at left). 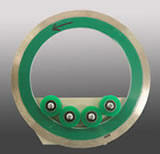 The green ring is a backer plate that adds strength and rigidity for the fastest straight cuts. Will not do curved work. 6" Diameter will cut to 3" depth. Turn your Apollo Saw into a Taurus 3 with this assembly. 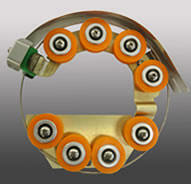 Use this cartridge for omni directional and detailed cutting. Three styles are available. Note: Once you have this cartridge, you can use it with any Taurus 3 blades that you already own. When your blade wears down, order a replacement below. 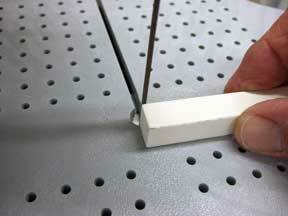 Rejuvenate worn diamond blades by cutting a sliver off of this dressing stone. The stone will sharpen the diamonds and will remove build up from the blade resulting in a restoration of cutting action. Stone is ½x½x6 inches long. Good for many, many blade treatments. Also works to refresh diamond grinding bits.